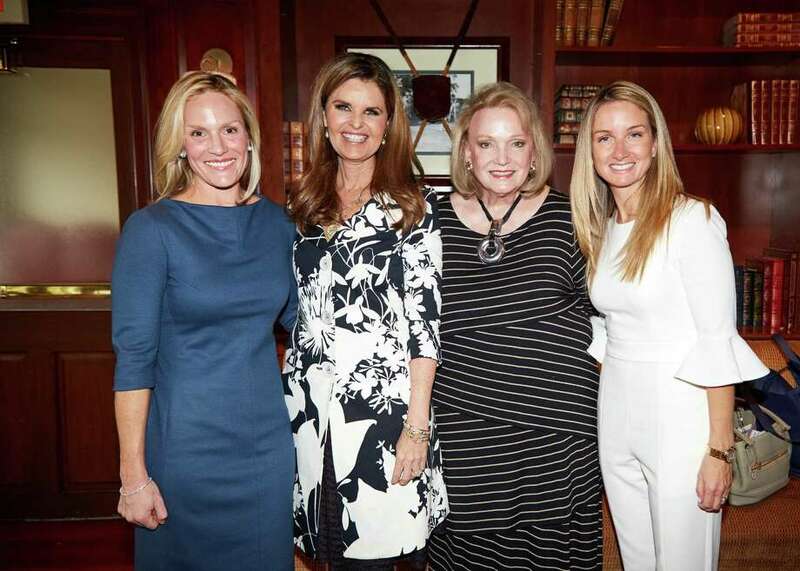 Center for HOPE Luncheon co-chairs Lauren Caffray, Jan Dilenschneider and Nancy Fazzinga with Maria Shriver, second from left. Out and about … New Canaan resident, singer and talk show host Harry Connick Jr. was seen shopping at Ruby & Jenna on Greenwich Avenue on Monday afternoon. Scene … Emmy Award-winning journalist and best-selling author Maria Shriver addressed a crowd of nearly 350 at the 2018 Center for HOPE Luncheon at the Country Club of Darien recently. In the discussion moderated by News 12 Connecticut health reporter Gillian Neff, Shriver focused on her new book “I’ve Been Thinking.” The memoir emphasizes prayers, wisdom and guidance and stories of her own life. Over $110,000 was raised at the event — all to benefit the Center for HOPE and The Den for Grieving Kids. The programs from the Family Centers offer counseling and support to residents of lower Fairfield County coping with loss, critical illnesses and life-altering circumstances. For more info, go to www.familycenters.org or www.facebook.com/familycentersinc . Out there ... The Harlem String Quartet will perform at 3 p.m. Saturday, March 24, at the Cole Auditorium at the Greenwich Library as part of the Ashforth Children’s Series Curiosity Concert. The renowned ensemble has performed at Carnegie Hall and throughout the United States and Europe. For more info, visit greenwichlibrary.evanced.info/signup/EventDetails?EventId=38122, or call David Waring at 203-622-7917. Scene … The Greenwich Art Society’s 101st Annual Juried Exhibition V.I.P. Walk and Private Tour is planned at the Bendheim Gallery at the Greenwich Arts Center at 299 Greenwich Ave. The event will be from 5:30 to 7 p.m. Thursday, March 22, with Metropolitan Museum of Art curator Randall Griffey. Tickets are limited. Go to greenwichartsociety.org or call 203-629-1533 for more information. On the screen … The Performing Arts Center at Purchase College is hosting National Theatre Live, which presents the Tennessee Williams’ classic, “Cat on a Hot Tin Roof.” The revival of the play, directed by Benedict Andrews, starred actress Sienna Miller alongside Jack O’Connell and Colm Meaney. The broadcast of the taped live performance will be at 2 p.m. Sunday, March 25. For tickets ($10 to $20) and more info, call 914-251-6200 or visit www.artscenter.org. Out there … The Greenwich High School Band Program will host the Essentially Ellington Regional High School Jazz Festival from 11 a.m. to 6:30 p.m. Saturday, March 24, at the GHS Performing Arts Center on Hillside Road. Tickets ($10 adults/$5 children & seniors) will be available at the door. Each band will perform for 30 minutes. It concludes with a Judges’ Exhibition Performance at 6:30 p.m. and the awards presentation. Out there … Sandy Deanne, Howie Kane and Marty Sanders — three original members of Jay and The Americans — will join lead Jay Reincke in a rock-and-roll show at the Ridgefield Playhouse at 8 p.m. Saturday, March 24. For tickets ($50), go to www.ridgefieldplayhouse.org or call 203-438-5795.